I love these socks! It is very hard to find them in a smaller women's size. They fit perfectly. They are very soft and wash up well. I will be ordering more. Given as gift & were loved by receiver. These are great. Warm and does not leave marks on my legs. I received my socks yesterday and am placing another order today for 6 more pair. They are THE BEST socks I have found to date. I am diabetic and suffer from severe edema of the ankles and feet. these socks actually fit, are soft and warm. I have no cons about them. 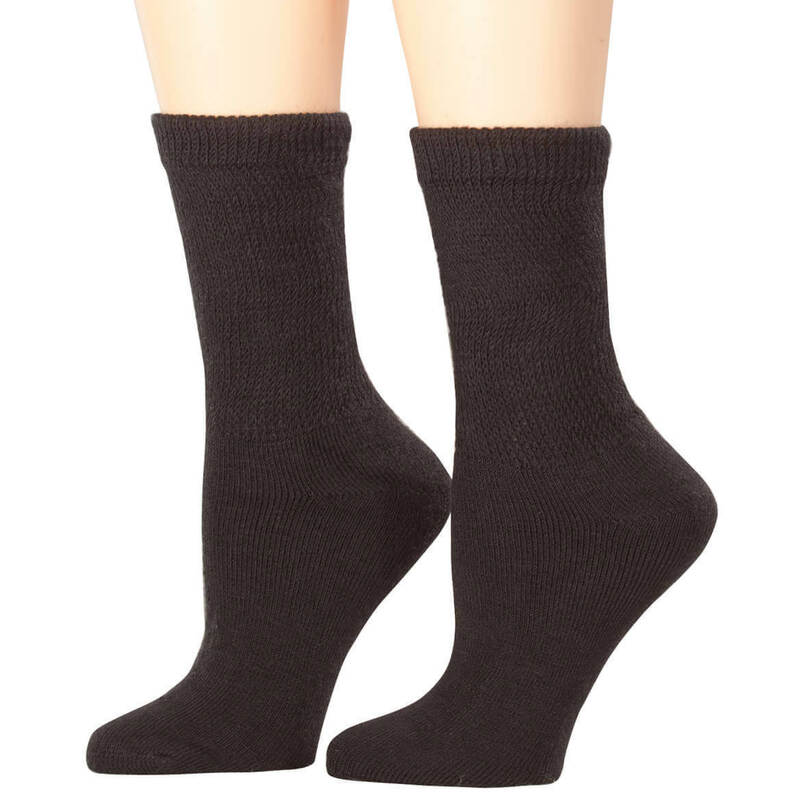 Never leaves tight ring like regular socks.....wash well and so very comfortable. The best part about these socks is that they are made in the USA--and the tops don't ravel. Socks are roomy, non-constricting and very comfortable. Have bought lots of diabetic socks and these are the best I've found. Plan on buying more soon. I will be purchasing more of these wonderful socks. 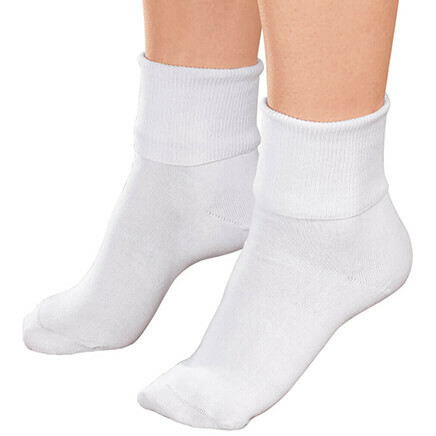 Have been searching for super soft socks that stretch at the top and are not tight for my Dad. He has sore senative feet and swelling ankles. He is very happy with these, they just come up longer on his legs than what he is use too. We have tried a lot of different socks and these are the only ones he liked. These socks are really nice and warm. My sister is a diabetic and her feet are always good. She just loved these how soft and warm they. The socks are soft and the color is nice. I just need more cotton content in a sock so they don't work well for me. 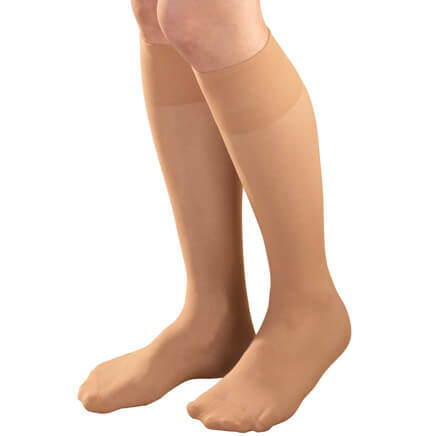 I was happy to see that there were a thicker version of the diabetic socks. The regular ones fit well and were much more comfortable than regular crew socks. 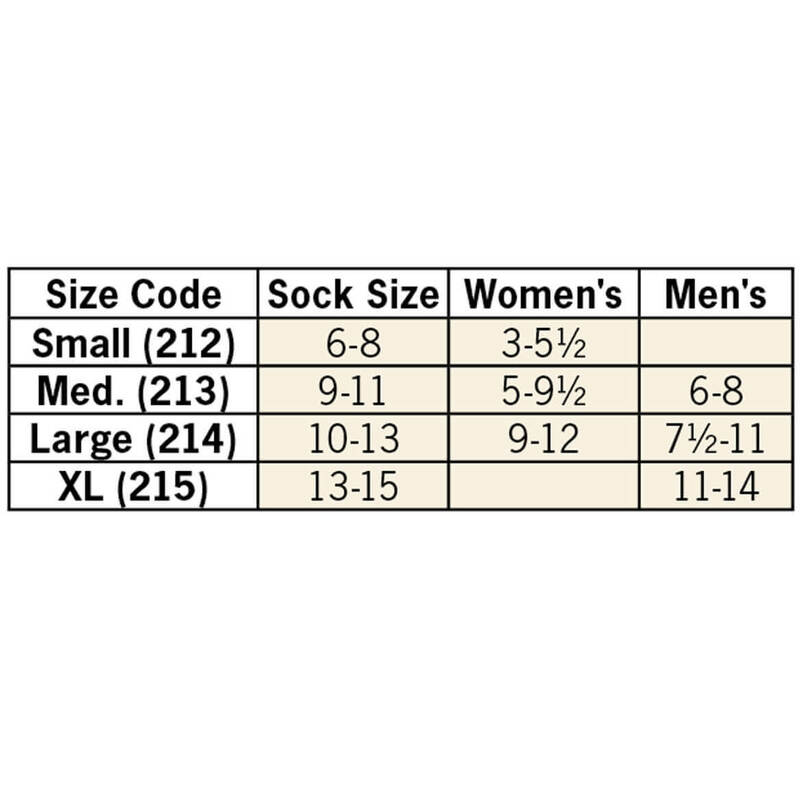 I used the sizing chart listed. Since the medium size fit perfectly the first time I ordered socks, I used the same size. Unfortunately, the extra-plush socks I ordered were actually too small. They barely cover my heel and tend to ride down my foot as the day goes on. Mom and MIL love these. Easy to get on and very soft and warm. My mom gave me some of these socks as she liked them. I love them -- so comfortable and protective of my achy feet! ! So I ordered some for myself. didn't know which of the multiple choices you have which one I would like. My husband read the description of the socks when we got the mail catalog and it seems to be what he needs. He wants to try to see if the socks will help his feet. THESE SOUND LIKE WHAT I'VE BEEN LOOKING FOR FOR SEVERAL MONTHS. My husband likes these socks. My husband is diabetic and likes these socks. My daughter can't find any navy blue socks, so I got them for her for Christmas. The word "plush" caught my attention. Foot problems call for special solutions, so these will be so comfortable on my sore feet! my husband does not like tight socks. I have been looking for gray socks and I am diabetic so these fit the bill. Would have preferred the ability to order them individually rather than in a 3 pack. Looking for a good quality sock. been looking for soft acrylic blend socks for quite a while so I thought I'd give these a try. Bought the other socks 4 years ago for my husband. He loves them. Wanted to see what "plush" was like. my spouse likes these socks. 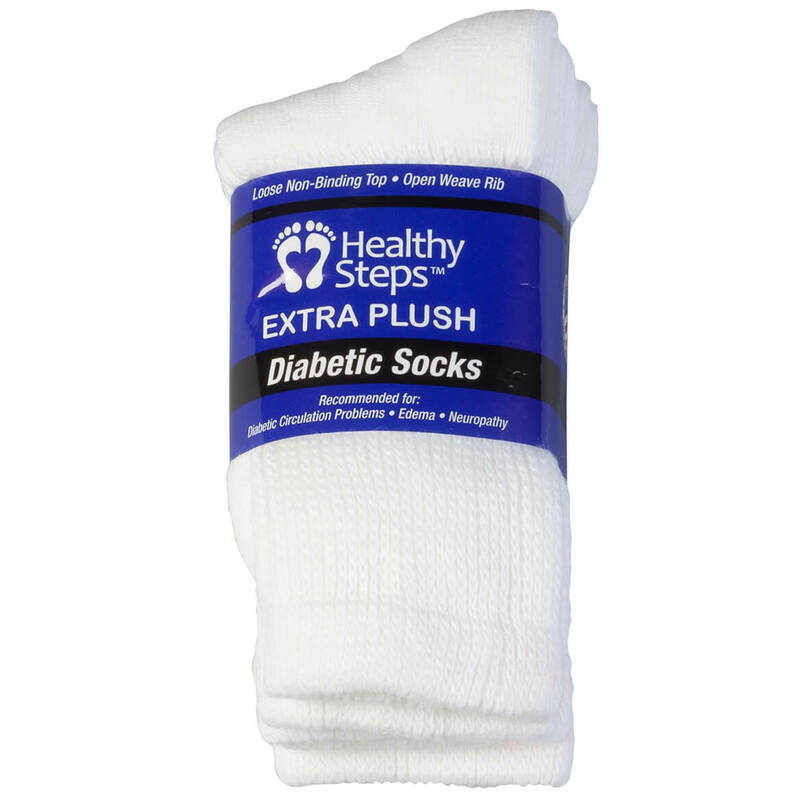 Are these healthy steps extra plush socks sized for women or men? BEST ANSWER: Thank you for your question. Yes the socks are for men and women. We hope this information will be of help to you. How "long" or how far up do the full-length extra plush go on the leg? Thank you. BEST ANSWER: Thank you for your question. It will depend on how long the lower part of your leg is and how big your foot is. If is it short and smaller they are it will be able to go higher up verse if you have a bigger foot and longer calf. We hope this information will be of help to you. The length of the sock on my leg is as the photo displays. These socks stay up where they're supposed to stay without being too tight, which is important to me. what size is XL white? BEST ANSWER: Thank you for your question. The size chart is the tab next to the Description tab. We hope this information will be of help to you. what size is medium vs. small husband wears a size 81/2 shoe? BEST ANSWER: Thank you for your question. The sizes for this item are Medium for mens is 6-8 and the Large is 9-11. We hope this information will be of help to you.